Baby Hazel, an adorable, bright eyed little girl, loves to take care of her furry friends: Honey Bunny, a kitten named Katy, and a bird named Budgie. Every activity results in boosting happiness and a higher score. The happiness goes down whenever you do something wrong. However, this game is super easy since there is constant guidance and you only have to use the mouse. Help her care for her pets, such as holding them, feeding them, talking to them, and playing with them. In this level, the pets are angry and upset. Baby Hazel arrives and calms them down. She decides to help her pets feel better by throwing a pet party and inviting her friends to come over and bring their pets. They are all very excited. Honey Bunny tosses a beach ball, waking up Katy. They bounce the ball back and forth, then Katy sips some milk. Baby Hazel rings the doorbell and applauds to Honey Bunny’s extraordinary juggling abilities. Honey Bunny then thinks it would be funny to throw the ball at Budgie’s cage, but is later scolded for doing so. 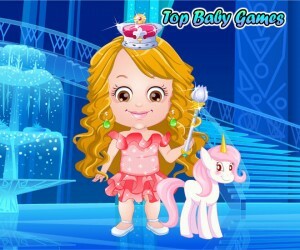 This level becomes a little more challenging as you have to groom and dress up the pets in preparation for the party. Meanwhile Budgie, in an act of revenge, attempts to destroy the bunny’s costume, only to be scolded and put back in the cage. While everyone is having fun being dressed up, Budgie gets angry for being the last one. Budgie eventually gets over it and is dressed up as well. The party begins. The party is set up in the backyard, with a pool, trampoline, food, swings, sandbox, and toys. Budgie enjoys time on the swing while the girl, Katy, and Honey Bunny jump on the trampoline. Honey Bunny joins the little girl in the sandbox while Katy rests, sipping her milk. The bell rings and Jake arrives with his pets. While Jake and the hostess bounce on the trampoline, the animals snack away on their favorite treats. Jake’s cat then ruins the little girl’s sand castle, causing her to cry. Jake helps her feel better by handing her a gift. Throughout the whole level, you constantly have to attend to the needs and desires of the party goers to keep the happiness up and the score high. The game gets harder when the bell rings yet again, and Liam arrives late with his turtle and dog. Liam then decides to demonstrate his dog’s hoop jumping trick. After this, Baby Hazel shows her friends that her fish can jump through a hoop. This level is short and easy. A pet show is held to finish up the party. They show off their talents and dance. It is concluded to be the best party ever. Overall, this game is cute and amusing. Baby Hazel displays an example of scolding and forgiveness, as well as responsibility. Oh, Baby Hazel’s pets are not in good mood. She has to find how to cheer them up. The idea is to to throw a pet party for them! She has to plan all the details and invite her friends too. Even pets need joyous time. Let’s help Hazel get all the pets ready for the party and make it memorable and unique. Pay attention to the her needs and her pets to ensure they all have fun at the party. Enjoy this fun filled pet party with Baby Hazel.